I bet that woman, whoever she is, in the congregation in the nave of the abbey who was also in yellow is going to hear about it! David Beckham just arrived looking well.... swoon! 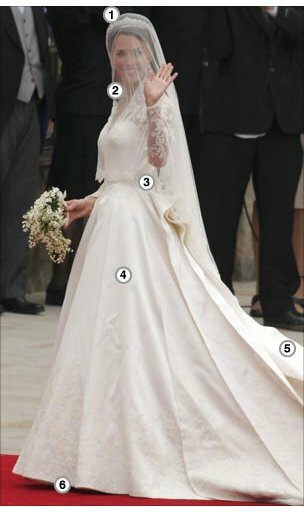 Don't know that I love the Dress, not that I hate it--but why is Pippa wearing white?? The Dress was perfect: Simple and elegant. Pippa's dress was way too "clingy" for a church wedding. Guide Me, O Thou Great Redeemer, the first hymn sung at the wedding this morning--was also the last hymn sung at Diana's funeral. Well, I've just spent the last four hours in front of the TV.....and it was wonderful. William and Harry.....looking so grand in their uniforms, couldn't help but remember those two little boys who followed their mother's coffin many years ago, and what handsome men they have grown into...Diana would have been so proud of them today. 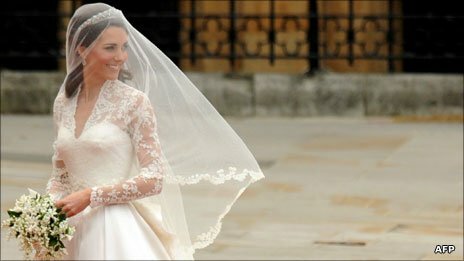 Kate......looked so beautiful. Her dress was exquisite without being flamboyant or show-offish. She is so dignified and no doubt in love with her prince, as he is with her. The service was easy to follow, and understand. The choir was outstanding, but I do wonder why there are no girls in it, in fact the whole church faculty is a real boys club. I was really impressed with Kate's brother's reading, considering he is not used to all this public speaking and appearance thing, he spoke perfectly, and really did his family proud. Her sister looked amazing, like something out of a fashion magazine, and the way she gathered the little ones like a mother hen and her chicks, she was a true bridesmaid. And the littlies looked gorgeous. In fact the Middleton family are all very attractive, and they kept their own identity amongst all the pomp and ceremony. The precison and timing of the event, was unbelievable, and it made this huge event actually look easy, as they say, the Brits do this thing better than anyone else. The way the police led the crowd down the Mall to Buck House in such an orderly and uneventful passage was like watching a movie with special effects. Moving nearly a million people like they did, was unbelievable, and the crowd stayed very orderly and happy. The balcony appearance and the TWO kisses, were worth waiting for, they do look so much in love. Well, I got up to use the bathroom around 5:00 am and couldn't resist turning on the TV, so guess who hasn't had much sleep today? Beautiful is the word. I love how the British celebrate their grand tradition. There's no country in the world that can equal it. Some commentator said they wondered how Americans could understand what royalty meant to the British because we have none. Nonsense! The British royalty belong to us, too. So what if that pesky Constitution said otherwise? I never saw so many oddments perched on women's foreheads! That's entertainment. I was kind of partial to Camilla's big gossamer donut of a hat. That was probably no accident Jeff.....a subtle way to bring the memory of Diana into the service from the beginning. And yes, Beatrix and Eugenie obviously got tips from their mother on what to wear. And Victoria Beckham looked as though it was not cool to look a little bit happy and excited about the event. And yes, I think some of those hats, were the sattelite dishes to beam the wedding all over the world. I never did see the face of the woman who was with Diana's brother, she looked like she was incognito. And I couldn't help but wonder, what Charles, Camilla, Andrew and Anne were thinking, when the words "let no man put asunder" were mentioned in the wedding vows. Seems to be a mockery to the family that is head of the Church of England. But all that aside.....today was about William and Kate, young and in love who will show em all how to do it right. Yes, I liked the two kisses. The seoncd one was much less formal and fun!! Youc oudl tell thr first one they wer elikle - right lets do it and get the anticipation over!! As I was watching E! they were saying in the US they don't do hats or fascinators for weddings.. thats really normal for UK weddings! perhaps not quite as big As Eugene and Beatrice mind you! E! also noted that this was a hymn sung at Diana's funeral so I think that must have been announced before hand.. presumably *just* beforehand... a bit like the details of the dress being announced *just* after she left the hotel! And for John.. here you go! There was a million people around the route and half a million in the mall apparently according to London police..